Around the world, in over 20 countries, more than 250 Carrotmob campaigns have taken place. In a Carrotmob campaign, a group of people offers to spend money to support a business, and in return, the business agrees to take an action that the people care about. Students and teachers have long been organizing Carrotmob campaigns, so we developed a new curriculum that can be used to lead a hands-on course on Carrotmob, giving students real-life lessons on how organized consumer spending can incentivize businesses to improve sustainability. Teachers: please take it, download it, experiment, and rewrite it. If you create your own lesson plans, we'd be happy to post them on our site, so we can develop a free set of resources for educators. The first student-run Carrotmob occurred in Bangkok in February 2010. Junior high and high school students of the International School of Bangkok wanted to incentivize the Villa Market to stop using plastic bags. Before the mob, the store was giving out 500,000 plastic bags a year. Plastic bags pollute the environment, poison the food chain, and kill over two hundred thousand birds each year. Students from the school’s green club, the Green Panthers, motivated their fellow students and community to create the extremely successful Villa Market Carrotmob, our highest grossing mob to date. The deal: Bangkok’s Villa Market agreed that if more than 500 people made purchases, they would stop using plastic bags. After a successful mob of 1,397 shoppers, and the supermarket posting record sales that day of $19,000, Villa Market officially stopped using plastic bags and now offers reusable cloth bags. 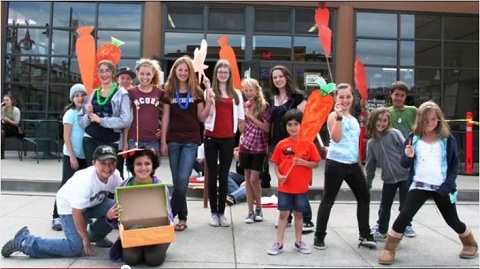 Students from Prospect Sierra Middle School in El Cerrito, California staged a Carrotmob at Mediterraneo, a local pizza parlor in Emeryville. With the Carrotmob proceeds the business spent over $2000 to upgrade its refrigeration equipment and purchase green packaging products. The remainder of the funds from the Carrotmob were donated to the Green Schools Initiative. The impact of the Carrotmob not only helped the businesses meet their green goals, but also carried over to the Public Market at large, where it sparked a new composting program for the entire food court. The Emeryville food court now diverts 52 tons of compostable waste from the landfill each year! The student-led campaign was so successful, they won a green award from their local council. Chan Sau Yee, a second-year student at Temasek Junior College (TJC), spearheaded the initiative with a group of seven schoolmates as part of a service-learning project under the College’s leadership program. The group of students mobbed a bubble teashop in central Singapore. With tea sales, Carrotmob T-shirts sales and a grant from a National Youth Council program, about $3,800 was raised. 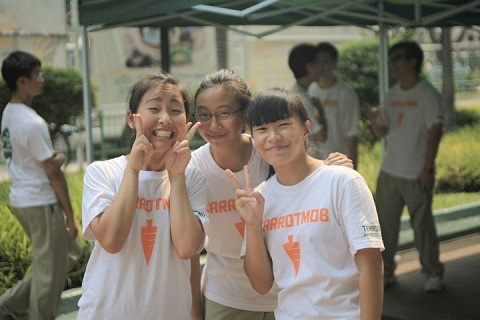 How did Sau Yee and her team manage to convince more than 300 of their schoolmates to take part in the Carrotmob? She said: “We experimented with many novel ideas to attract attention, including hanging carrot-shaped objects made from recycled materials all over campus and planting real carrots. Eventually our publicity efforts paid off, the excitement grew and many students were keen to be part of the Mob.” In addition to a successful Carrotmob, the students at TJC raised awareness throughout the school on the importance of going green. These are just a few examples of Carrotmob student-led change. Students from around the world have been participating in and leading Carrotmobs, making big changes in their communities!